WHAT?! Amazing Party Tops For Less Than Rs 500? Oh YES! Parties, for us, are just another reason to buy new clothes. The moment you get invited to a party or you plan on hosting one, the first question that pops up in your mind is “What do I wear? !” While it maybe impractical to go to the mall and shop for every new party you’re about to attend, you can still sit at home and get affordable and amazing new party tops - for less than Rs 500!! We are not even kidding. See for yourself! 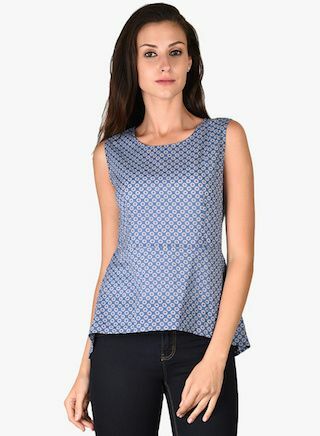 We are in love with this peplum top! The subtle sheen and the design makes it droolworthy and perfect for that party you want to attend. Price: Rs 399. Buy it here! The richness of this colour flatters almost any skin tone and the halter neckline is to die for! Want! Price: Rs 450. Buy it here! Get ready to drop some jaws in this animal printed top. Team it with a plain solid coloured skirt and some accessories and own the night! Price: Rs 499. Buy it here! 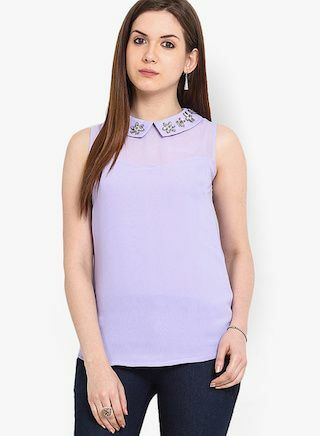 Can’t take our eyes off the cutest collared top...and when it comes in the sweetest colour - we drool! Price: Rs 402. Buy it here! Do the math! When you combine lace with pristine whites, it automatically creates an ultra feminine chic top that we want RIGHT now! Price: Rs 403. Buy it here! Off shoulders have officially found a place in our hearts this year and we are crushing on this paisley top with cut out shoulder detailing. So pretty! Price: Rs 479. Buy it here! This sheer maroon top is all you need to stand out at that party. Rock this top over your favourite skinnies and go out and break a few hearts. Price: Rs 400. Buy it here! How cute is this pink top with its sleeve detailing?! A perfect pick if you’re not in the mood to go all out at a party but you still want to make that killer impression! Price: Rs 320. Buy it here! Black and white - the ultimate classic that has elegance and sophistication written all over it! And this is exactly what this top reflects. Price: Rs 345. Buy it here! Can’t get enough of black now, can we? And we also can’t stop imagining how this pretty black top would look on us. So much love! Price: Rs 450. Buy it here! MUST-READ: Party Time: 10 Dresses We’re Crushing On Right Now! MUST-READ: “Let’s Get It Started!” 17 Signs You ARE The Party!